I have a Heidelberg Windmill Redball that came with foil stamping capabilities. I am attaching a variety of photos because I’m out of my depth with this thing. I’ve foil stamped before, so I know the general principals and setup. 1) How do I feed foil through this? I might have some kind of bar that could, perhaps, mount underneath the chase area for foil wrap up? Otherwise there is that mystery bar behind the press?? 3) Just any general advice about this foil setup and it’s function would be great. I am uncertain how to search for it to find anything like a manual or anything.. Bonus question: Can I use my fountain with this setup? I cannot figure out how to drop down the fountain tray..was going to clean it/dust it when I first got the press but was unable to. Also there is no numbered gauge for setting the fountain. BL/YELLOW: is the area to lock plate into the chase. I would find and use a few layers of MICA to insulate the plate from furniture. YELLOW: looks like the clamp to put cables in. this should keep them from getting mashed. LT BLUE: is a bunter post for attaching the die. you need a minimum of 2. ORANGE: is one of the power plugs. the shielded thermocouple prob screws into the bottom or top. There is a rod with brackets that mounts down below the chase area. that is where foil goes. The problem with this set up is, there is only so much room in there when it closes. It then forces you into small rolls; A) 400ft? or less; and ordering foil on 1/2 inch cores. It looks to be fairly complete except for the lower foil rod. I am wondering if they didnt try running foil through the frame . That might explain the extra rod and pillow block bearings on the back. if so, that would Really cut into options as far as working area. I should have that rod, I’ll poke through my box of supplies. And a bunch of random foil came with the press, so hopefully it is mostly stuff that will work with this setup! So do I only need to lock the base up in the one direction, then? As opposed to one vertical quoin and one horizontal? if you have some short furniture and can work around the wires, then do it both ways. Your set up may change to meet requirements of specific jobs. But, a heat plate like this cannot be locked up “Too good”. I found the foil rod! Now..how to attach it? 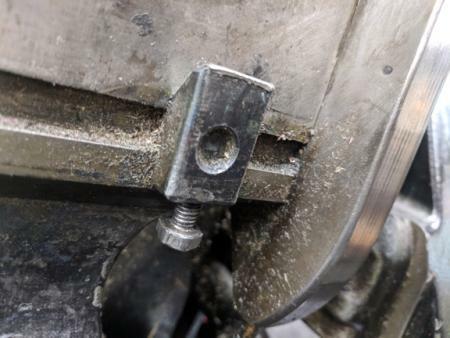 The way that seems obvious (unscrew bottom bolts until I can slide notches of the foil attachment on, tighten bolts again) …cannot be done with the chase in there. My next move would be to attach to the front of those bottom “base” pieces (the first photo)..but there isn’t any spot to screw into? Or maybe I’m not seeing something. Or, it is possible that, that specific foil bracket was never in that specific press. Many times, things get “thrown together” and not really looked into. Your best bet may be to find someone who knows a bit of drilling and tapping and have some mount holes/bolts/brackets put in there for you. Look for unused holes down the sides right there. there maybe some “L” brackets used to bring the vertical side surface to horizontal. Annie- That’s the correct foil bar for the press. The two metal blocks hang down and the two slots slide onto the bolts. Basically, turn the bracket 180 degrees from it’s position in the second to last photo. John, The rail hangs, what looks to be upside down? with the foil roll clamps/guides hanging down then? I dont know. i dont have a foil unit for my mill. If you desire not to do foil stamping I would be interested in buying the heat plate. I had mostly figured out how to attach my foil roll and feed it. I was having some issues with even heating though — the wiring that came with the heating rods is pretty beat up. Does anyone have any ideas about where to get new rods? Things get hot..so all the connections from the main switch through the press are working..just the wires to the rods themselves are a little fussy. Thank you all for your help as always!! you can find “bunter posts” at “sterling toggle”. you may need to have an account. if so, reach me. i will get them and have them drop shipped to you. The heating equipment on the foiling unit can be replaced and upgraded with standard industrial and scientific components like those available from Watlow or, at the low end, Auber Instruments. West Coast Plastics is a distributor for Watlow heat controllers, relays, thermocouples, and cartridges in the US. You should be able to pull the specs from the casing on the cartridge heaters and find a suitable replacement from Watlow. As EricM said you’re looking for Bunter posts to attach your dies. One additional note is that you need the low height metric posts to thread into your baseplate. 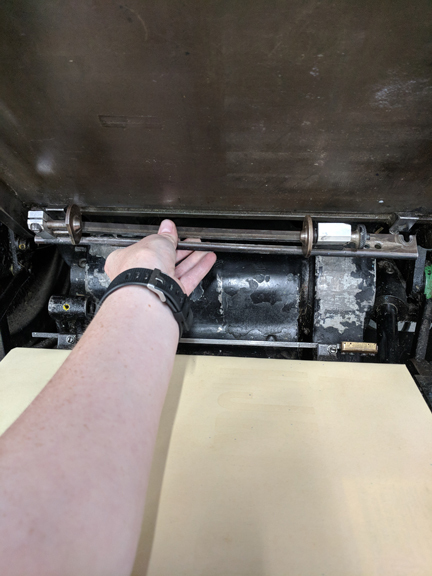 American Printing Supply stocks them in the US and marks them for Heidelberg. I have a windmill with the foil puller like yours. I had never tried foil before but figured I would teach myself what to do. When I tried the used hot plate I had gotten it was a wiring mess. I did what I could to clean up the wiring slices and mess. The first time I turned it on it shorted out and blew the rods and and controller. I also had an old Boss controller and when I pealed off the nameplate found it was made by Watlow back in day for Boss I guess( long before the internet). I bought new Watlow rods and a new thermocouple. I figured Watlow rods - Watlow contoller should work well. I made sure I got the insulated braided protected wires so the rods could not ground out like they did before. 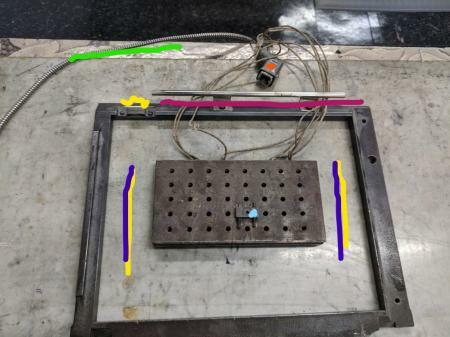 I had to create a work around for the thermocouple to get it seated in my plate. I hooked it all it and it worked fine. I have the undermount foil setup like yours. I buy my foil from Infinity and had them reroll it. 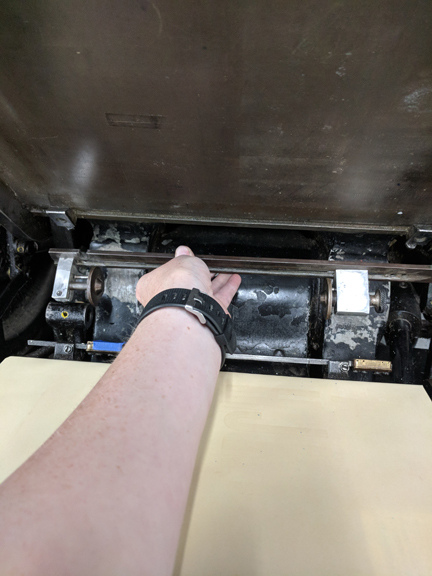 By rerolling the foil I had a easier time controlling the tension as it came out up off the spool. It no longer would rub the bracket plus it stays away form the die and stopped the preheating of the foil. If up put a roll in backwards you will see it spools from the front of the roll not the back under the bracket which was why we reroll.